Is the Samsung Galaxy Note 2 about to get another challenger from Sony? 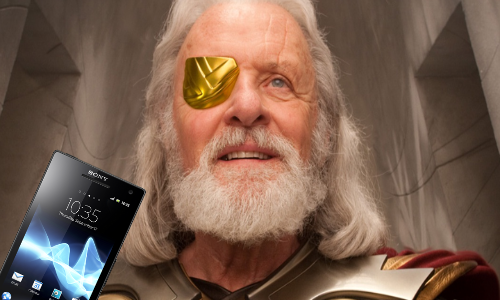 According to rumors, the Japanese company is now busy working on a phablet that’s named after the one-eyed ruler of Asgard and Thor’s dad — Odin. The success of the Samsung Galaxy Note 2 and the high interest in the HTC DLXjust goes to show that phablets could be the next big thing. Sony seems to think so because for 2013, rumors suggest that their flagship device will be a phablet called the Sony Odin. Not only that, it will come in two variants — a 5-inch and a 6-inch model. Reports reveal that Sony’s new device(s) will be under model numbers C6502, C6503, c6506. This suggests that we may see regional or carrier variants. One of those model numbers may also be the designation for the bigger 6-inch device. Word is that Sony will be doing their device’s namesake justice by making sure that the Sony Odin is fit for a god. The phablet will have a a quad-core Qualcomm Snapdragon S4 Pro APQ8064 processor, 1080p display and 2 GB RAM. With these specs, it could easily give the HTC DLX a run for its money and the6-inch version will dwarf the already huge Samsung Galaxy Note 2. Will the Sony Odin be the device to dethrone the Samsung Galaxy Note 2? Is a 6-inch phone too big or is Sony’s plan to add another half inch a stroke of genius? Discuss in the comments below!